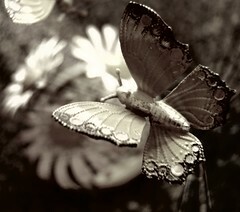 This edited photo makes the metal butterfly look much nicer than it is. It's actually part of a kind of ugly metal knick-knack. Joel rolls his eyes about the fact that I keep it out, but I like things that are kind of ugly/pretty.